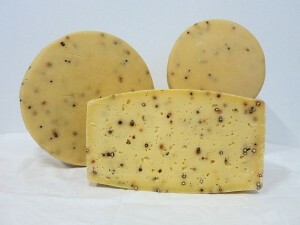 For details of local cheese makers, see the relevant part of the Local Food Directory. Hard cheeses are a very different proposition than soft cheeses. With hard cheeses, you just need to decide which type to buy. My current favourite local, hard cheese is Pecorino Pepato (pecorino with peppercorns) from Heidelberg West-based Wholemilk Continental Cheese Company. Both tasty and very reasonably priced. If you go to their shop/factory (32 Kylta Road, Heidelberg West, 3081), like I do, you get presented with a range of Italian cheeses in wheels, bags or logs and they cut off the requisite amount for you. If a shop in the middle of the Heidelberg West industrial area does not appeal to you, you can also buy their cheese at Deli Delitz, Bulleen; Ivanhoe Pasta Deli, Ivanhoe; Super Fruits, Ivanhoe; The Pines Deli, Doncaster East; or Tunstall Deli, Doncaster East. That’s Amore Cheese, is another local maker of Italian-style cheeses. Its range is extensive and, even where this range overlaps with that of the Wholemilk Continental Cheese Company, the cheeses can be very different. For example, their Pecorino is a semi-soft cheese rather than hard. The main source for That’s Amore Cheese cheeses is their own shop in Thomastown (66 Latitude Boulevard, Thomastown, 3074), which is also a cafe and a deli. But you can also buy their cheeses in Eltham Deli; IGA Gervasi Thomastown; Leo’s Fine Food & Wine, Heidelberg; Leo’s Fine Food & Wine, Kew; Psarakos Market Deli, Bundoora; and Toscano’s Kew. Yering-based Yarra Valley Dairy is a local producer of many soft cheeses. My current favourite is their Le Jack Black Savourine goat’s cheese. If their own shop (70-80 McMeikans Road, Yering, 3770) is too far away for you, they have a variety of other local outlets, including: Croydon Brewery; Jefferies, Croydon Hills; Kellybrook Winery, Wonga Park; Leo’s Fine Food & Wine, Heidelberg; Lettuce Inn, Hurstbridge; Mitcham IGA X-press; Paul’s SUPA IGA, Ringwood East; Ritchies SUPA IGA Yarra Glen; and Wandin Valley Produce. Eltham Deli: includes Manchego, Wensleydale, Caprakaas and Gruyere (optionally sliced to order). Bolton Street Deli, Eltham: includes Caprakaas, strong or mild (rather strangely, they sell this cheese unmarked) and Gruyere. Jones The Grocer, Westfield, Doncaster: a wonderful, refrigerated, walk-in cheese room (but not the cheapest). Or, if you want to really pamper yourself with cheese delivered to your doorstep, you can order a range of unusual European cheeses online from Brunswick-based Cornelius Cheese. And, of course, you can buy just about any cheese imaginable at Queen Vic Market. Finally, for my friend Mary who recently refused my offer of some ripe, triple cream cheese on the grounds that it would be too fattening: see the article entitled “Can a diet of cheese help you shed those excess pounds?”. Their answer is an emphatic ‘yes’! And, as we all know, if it is in a newspaper then it must be true!